A press report can’t really cover the depth and complexity of a planning application for a sensitive site like this, and neither can I. But I wanted to make a few points, after reading some of the reports and other documents available on that link above. The committee report in particular is worth a read, as it summarises the important points and the responses. It’s included in the list on that link above, or try this link (PDF). In April 2015 English Heritage separated into two separate bodies (English Heritage and Historic England). 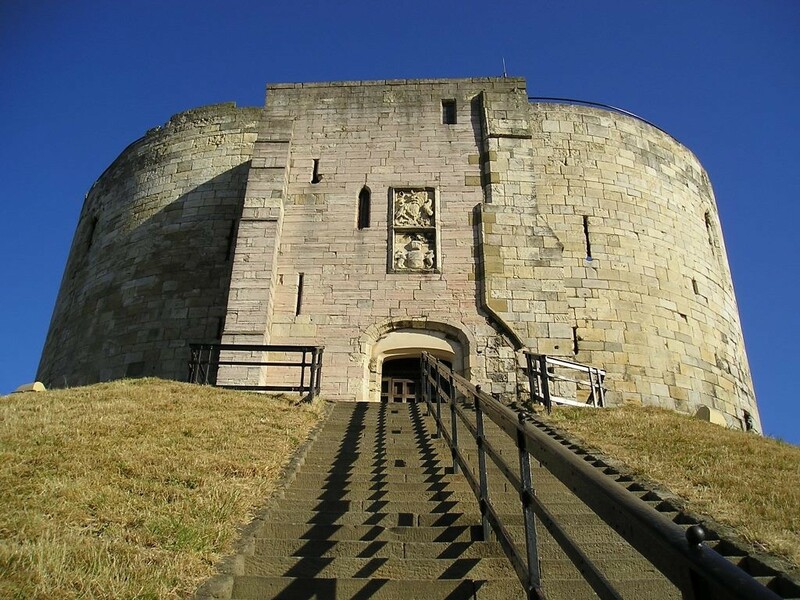 The new charity, retaining the original name “English Heritage” is responsible for looking after the national heritage collection of monuments and sites, of which Clifford’s Tower is one of the most visited heritage assets. All assets are expected to be self funding by 2022/23 when “Grant in Aid” from the government will cease. This seems to be a crucial point, doesn’t it. There’s apparently a need to get repairs and enhancements done before the current funding arrangements stop. And to enable English Heritage to make more money in the future from this ‘heritage asset’. 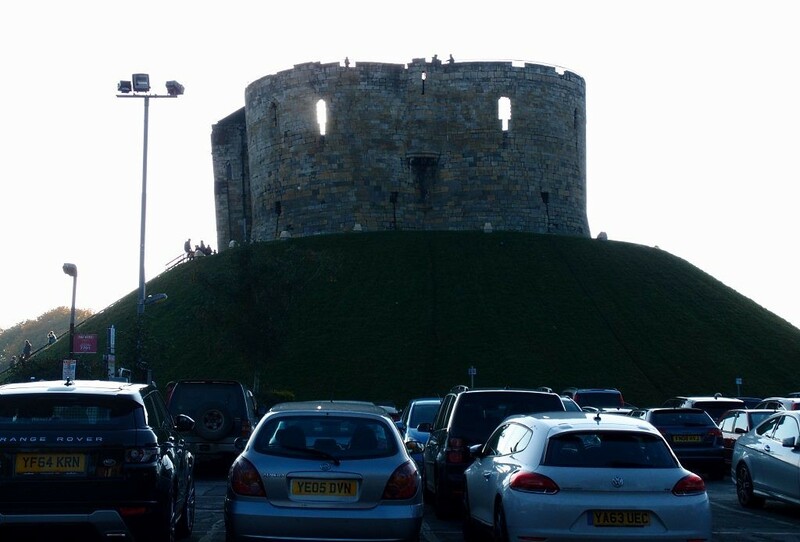 How many of us York residents regularly visit Clifford’s Tower, I wonder, in terms of paying to go inside. How many of us have never visited? Most of us appreciate the building from street level, down below, looking up. Which is presumably why the visitor centre proposed for street level is seen as the most objectionable part of the plans. I’ve been trying to recall if I’ve ever been inside. If I have, it was many years ago and I don’t remember it. Perhaps, like many other visitors, I found it ‘underwhelming’. Although I am aware some English Heritage sites do not contain much this one was quite disappointing. EH fail to make the most of this striking property. The children were very keen to climb the steps and go in but once inside there is very little information about its history, and what there is, is badly presented. There is nothing in it apart from the view from the top! It means many things, this structure, this place, and is rich in complex histories. The current presentation and ‘visitor experience’ is perhaps not conveying this adequately. Hence the desire to add more to the inside and add a visitor centre outside. To make more of what’s there and help visitors understand and appreciate it. Is that so bad? 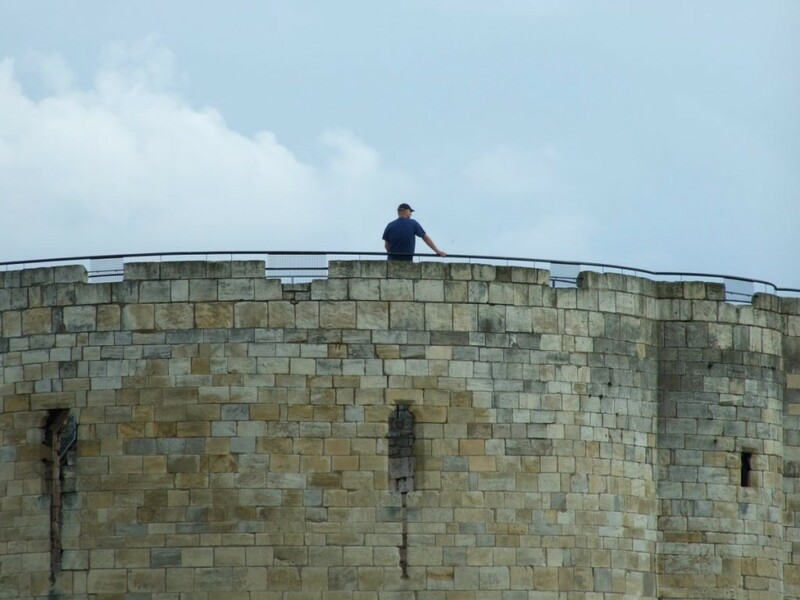 2) Introduction of a new structure within the tower surmounted by a deck at the approximate level of the wall walk – to enable better access to existing features and views. 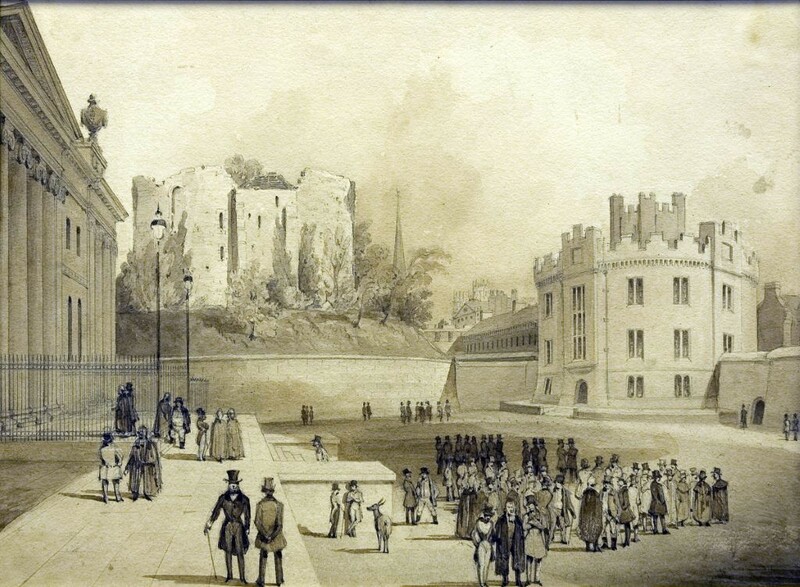 This site, Clifford’s Tower and its surroundings, has already been altered over time, as I’m sure many residents with an interest in local history know. The layout of the area immediately around the tower as we see it now dates from the 20th century, when prison buildings and walls were cleared. 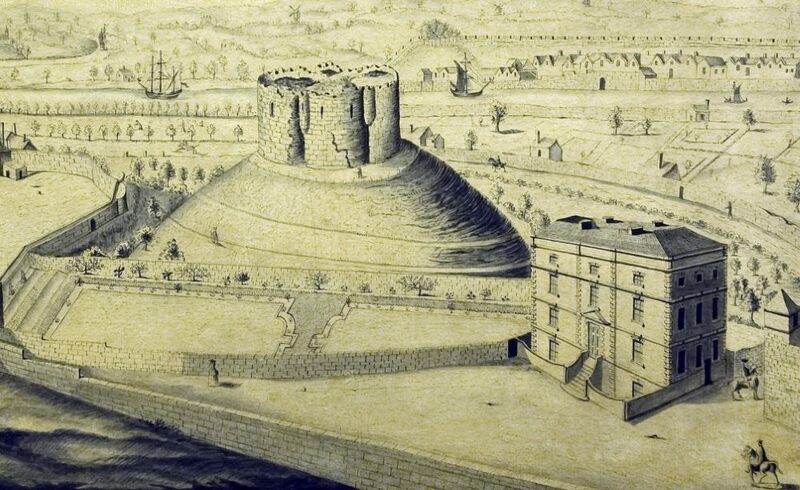 Clifford’s Tower itself has been on that mound for centuries, but hasn’t always been treated with the kind of respect it now commands. Thanks to the excellent online collection provided by York Museums Trust we can get some idea of how it looked in centuries past. 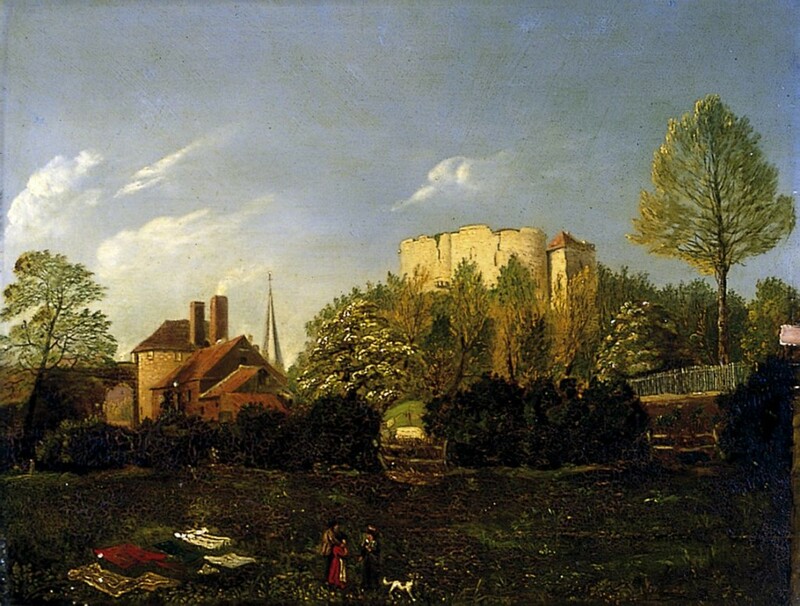 (All the following images are courtesy of York Museums Trust http://yorkmuseumstrust.org.uk/, Public Domain). It’s not possible to cover the entire history of Clifford’s Tower on this page, so let’s just focus on the last couple of centuries. It was, for a time, in someone’s garden, a rather impressive garden folly presumably only accessible to the landowner’s family and friends. This depiction appears to show a track winding around the mound, allowing a gentle, slow and elegant ascent. The kind of thing that might be helpful now in terms of increasing accessibility for wheelchair users. But unlikely to happen, as we now cherish the current appearance and the daffodils planted in the grass. 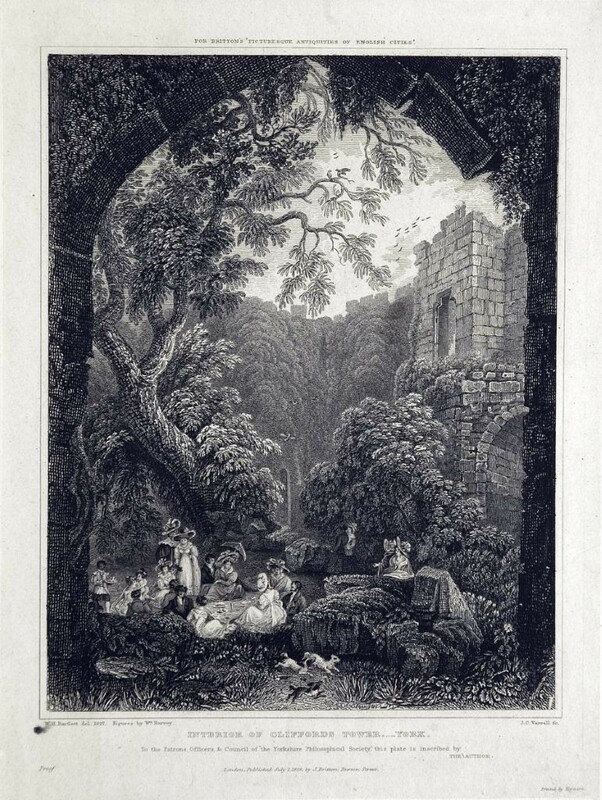 Trees grew up around it, and are also shown growing inside it, in this depiction, with a picnic in progress. Pictured here it’s all rather wild and wooded, with its mound covered in trees. A prison was built here in the early 19th century, on what is now the car park area, on the right of this image. Note the wall erected at the bottom of the mound, cutting in to it. In about the same place as English Heritage want to put their controversial visitor centre, almost 200 years later. The new visitor centre will apparently include part of this wall, revealed, as it’s still there, under the mound reconstructed on top of it in the 20th century. After the demolition of the prison and its walls the site was tidied and turned into a visitor attraction, and has been attracting visitors ever since. So, let’s get back to the 21st century. Here’s a photo taken on one of my walks, in the early morning, some years back. Blue sky visible through the openings near the top of this open-to-the-sky structure. And again yesterday afternoon, with the light round the other side and the tower in silhouette. The plans include the insertion of decking type structures inside, to increase the floorspace/viewing platforms. I guess these will change that silhouette shown in the photos above. The photo above also of course demonstrates that although the tower looks mighty impressive from some angles it basically rises up above a car park on this side. Getting rid of that would improve the area more than any of the present plans would, but it seems unlikely to happen in the foreseeable future, presumably because car parks bring in income for the council, and because, as we’ve seen with the current plan, any changes in this area are complicated, controversial, and costly. Changes are happening all over the city, have been for years, have always been part of it. What looks like improvement to some feels like a loss to others. For example, ‘the tunnel’ in the Museum Gardens, the remains of St Leonard’s hospital, just inside the entrance. It was atmospheric, intriguing, full of sarcophagi against the walls, full of meaning and clearly historic, but with no explanation. Now it has been cleared of the sarcophagi and basically serves as an exhibition space for information boards on the history of the site. The ideas behind its ‘improvement’ were no doubt well-meant, but, in my eyes, they made the place soulless and removed its charm and mystery. Just as all other visitor attractions and heritage assets have been updated, so I guess Clifford’s Tower will be in some way in the near future, whether or not the current plans are approved. The remodeling work of the first half of the 20th century left us with a nice tidy mound and a car park next to it. English Heritage want to make more of Clifford’s Tower, and presumably make more from it too, in terms of higher entrance fees once the improvements/changes have taken place. I’d prefer it to remain as it is, personally. Any ‘improvements’ for visitors won’t improve it for me. But we’ll adjust to any changes, in time. So many changes all around, already, and always. Generally well-intentioned, as becomes clear if you read the planning documents and see how much work goes into a planning application for a sensitive site such as this. In this case it included a public consultation where we were all encouraged to comment. I realise I’d probably get more of a positive reaction from readers if I joined in with the condemnation of the planned changes. But it seemed more important to look for the context and to think about the history of the site. The package of proposals being put forward in this planning application … is designed to greatly enhance the visitor experience, by enabling better physical and intellectual access to the monument, and by capitalizing on its elevated position to improve interpretation, understanding and enjoyment of the place and its histories. The planning committee meeting will be available to view from 4.30pm on www.york.gov.uk/webcasts. The meeting agenda is on this link. The relevant planning application documents (16/01642/FUL) are available on this link. Update: the plans were approved. 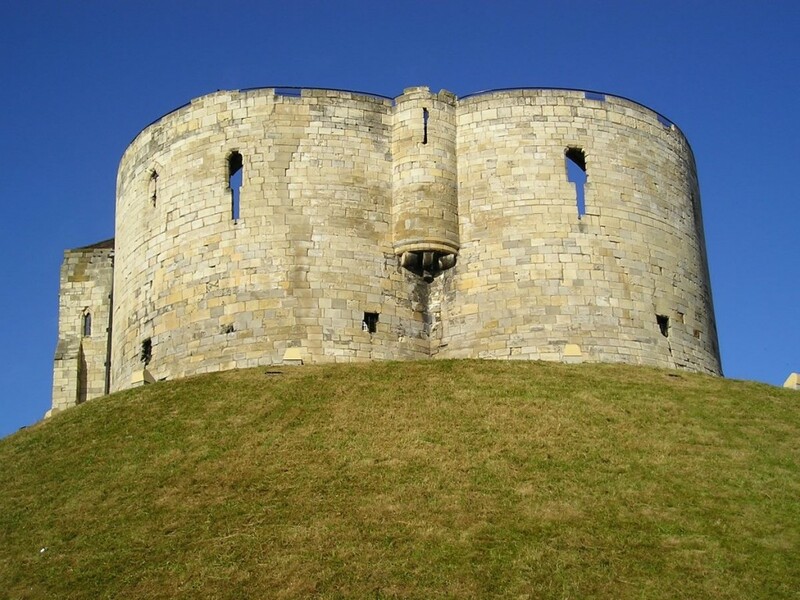 For any updates see all pages tagged Clifford’s Tower. It’s not just English Heritage hoping to make more income from their assets. Adverts may follow, which lead you to Amazon.co.uk and, if you buy anything via my links (like that one), it brings this underpaid writer/photographer/website administrator a few pence in advertising fees, via Amazon Associates. Buy enough and I might even be able to afford the entrance fee to Clifford’s Tower. The tunnel in the Museum Gardens! Was there ever a better teenage hangout?